I didn’t realize I was such a purist until I drove away in Mazda’s latest addition to the MX-5 range. The RF (Rectractable-Folding) turns the sports car into a targa-topped touring car, resulting in a cozy coupe. In ten seconds, at 10 km/h you go from coupe to convertible and wind-in-the-hair motoring. However, I personally favor the cloth-topped version and even the 1.5L engine – as opposed to the 2.0L version in the RF. The extra capacity is useful however, as the RF weighs just over 47kg more than the convertible. Changes include new materials for the folding roof and stiffer suspension settings. The roof sections are a combination of carbon fibre and aluminium, with a layer of sound-absorbing material included in the headlining, making the RF much quieter, roof up, than the previous rectractable roof model. However despite the weight increase, the MX5 has lost none of its agile handling and great driver feedback. It’s still great fun to drive, and my only real issue with this version is that I don’t think the flying buttress roof supports are an attractive look. Especially the front three-quarter view. 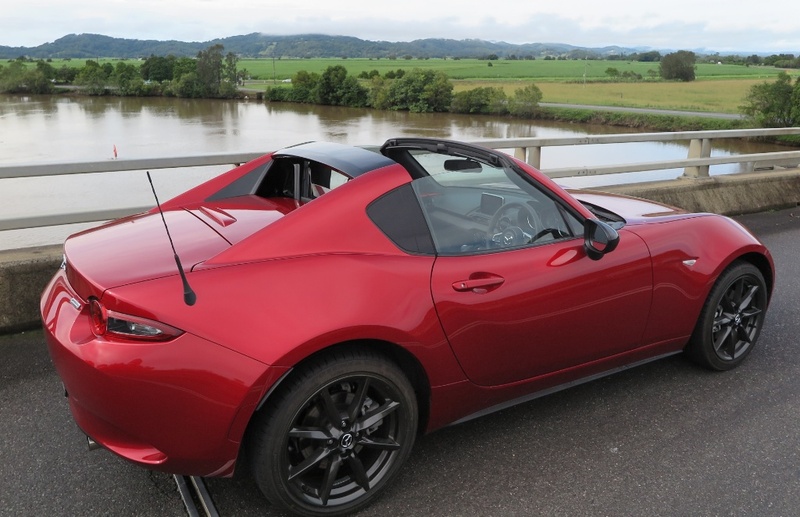 Whatever, I will have to be counted in the minority as Mazda Australia says it expects the RF to outsell the pure convertible, but the interesting thing is that the introduction of this model is as much about strategic action, as it is offering new choices. The convertible arrived in August 2015, so now is just the right time to introduce the RF, to rev up MX5 total sales.